In December of last year, I did several posts about different Christmas traditions in the U.K., plus one about the Lincoln Christmas market, which will be here again from next Thursday, December 3rd until the Sunday. So I decided to have a look at a couple of traditions I didn’t write about last year. And considering that Advent starts today, Sunday, I’ve put together some information about what Advent means and some of the traditions associated with it. 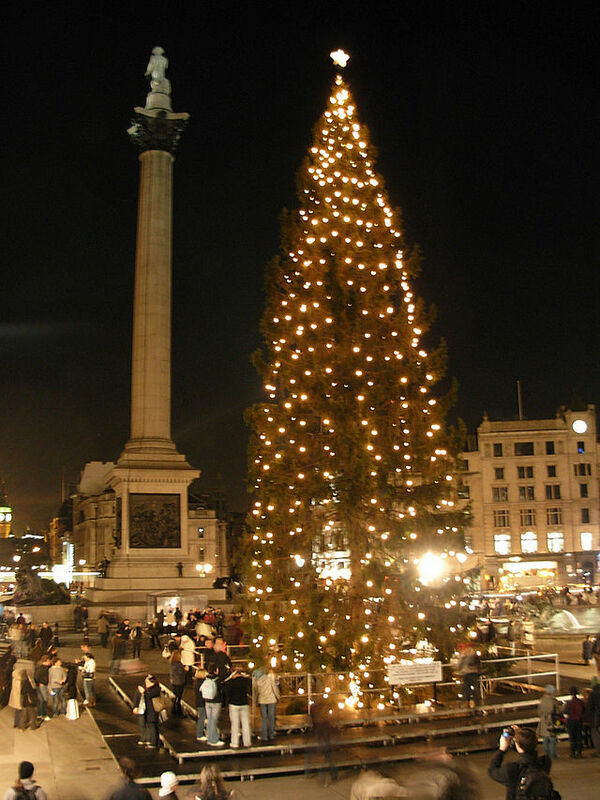 Trafalgar Square Christmas Tree. Author: Anneke. Creative Commoms. Advent starts four weeks before Christmas, beginning on November 30th (St. Andrew’s Day) or the Sunday closest to it. This year it begins on November 29th. The day marks the start of the Christian year and the beginning of the Christmas season for many people in the U.K. Some people even decorate their homes this early, although most leave the household decorating until a week or two before Christmas Eve. In towns and cities, however, Christmas lights and a large Christmas tree in a central place, like a market square, generally appear during the first week of Advent. The huge tree in Trafalgar Square in London is a yearly gift from Norway, in thanks for Britain’s support during the Second World War. The word Advent comes from the Latin word ‘adventus’, which means ‘arrival’ or ‘coming’ – referring to the birth of Jesus Christ as well as the time that he will come again. The origin of Advent preparations for Christmas is unknown, although it certainly existed by the year 480. It was also introduced by the Council of Tours (in France) in 567 as an order to make the monks fast throughout December until Christmas. Some people believe that Advent goes back as far as the time of the Twelve Apostles; others say it was founded by St. Peter. All in all, it is impossible to say exactly when it began. Several traditions are followed during Advent – other than decorating homes and towns and sending Christmas cards and so on. I think everyone is familiar with Advent calendars, as the one in my first picture above. What child doesn’t like to open one of the little doors each day from December 1-24, to see what’s behind? Some calendars have little Christmassy pictures behind the doors – some showing the Nativity, or having a poem or part of a story relating to it. Others have pictures of teddy bears, Christmas trees, bells, candles, robins, snowmen etc. – anything connected to the season and Christmas celebrations. Nowadays, many Advent calendars simply contain small chocolates. German Advent calendar (1903) from Im Lande des Christkinds. Windows contain Christmas poems. Images from a cut-out sheet were pasted over them. Authot Richard Ernst Kepler, 1851-1927. Public Domain. Lutherian Advent wreath with one red and three blue candles, around a decorated white candle, all lit. Author: Kittelandan. Creative Commons. These wreaths are made of evergreens, like holly and ivy or some kind of conifer, formed into a circle – which represents God, i.e. no beginning and no end. The ‘evergreen’ itself is a reminder that God does not change, holly also being a reminder of the crown of thorns placed on Christ’s head at his crucifixion. Four candles are set around the circle, plus one in the centre. The candles can be of any colour, the central one generally a different colour to the others. Sometimes, four red and one white candle are used, red being the Christmas colour. Unlit candles represent darkness. One of the outer candles is lit on the first Sunday of Advent, that one plus another on the second Sunday and so on until all four are lit on the fourth Sunday. On that day, the central candle is also lit, representing Christ as the light of the world. The other four candles also have meanings and prayers on each of the four Sundays focus on those themes. They are Peace, Hope, Love and Joy. Also, in Western Christianity during Advent, the usual liturgical colour is either violet / purple or blue. This colour is often used for hangings around the church, the clerical garments and, in some Christian denominations, often the tabernacle. Censing during solemn vespers. St. Mary’s Church, Greenville SC. Author: QuidMestXveritasatEnlish Wikipedia. Public Domain. A Christingle is used in many Christian churches in the U.K. during Advent. It is a symbolic object, its name meaning ‘Christ Light’, and is used to celebrate Jesus Christ as the ‘Light of the World’. The tradition was unknown in England before 1968 – so they weren’t a feature of my childhood Christmases. 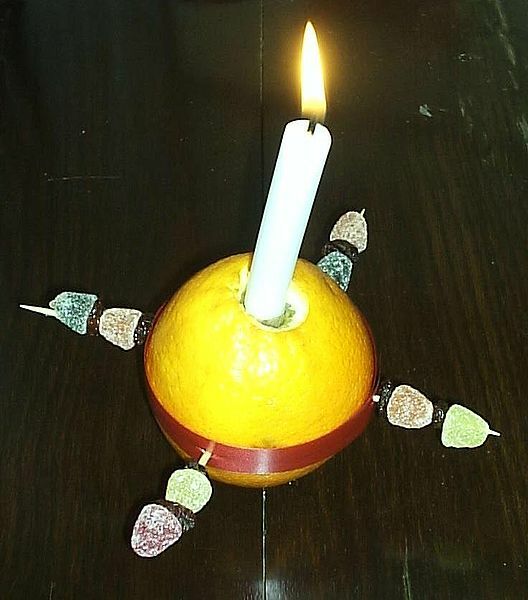 Picture of en Christingle. Author: TimmywimmyatEnglishWikimedia. Public Domain. Christingles have now been part of Advent celebrations in the U.K. for 47 years. It was John Pensom of The Children’s Society who introduced it to the Church of England in 1968. He adapted the form we see today from the original idea used by Bishop Johannes de Watteville in Marienborn, Germany in 1747. The bishop wanted to find a way to explain to children the happiness that comes through believing in Jesus. In his children’s service, he gave each child a lighted candle wrapped in a red ribbon whilst he said the prayer, ‘Lord Jesus, kindle a flame in these children’s hearts that theirs like thine become’. There are other traditions associated with Advent, including the singing of Christmas carols such as O Come O Come Emmanuel and Lo, he comes with clouds descending, at church services. There are also some old ‘folk traditions’, both in the U.K. and other European countries that I could talk about, but I’ll not go into all of those here. I’ll just mention the most familiar one in Britain, which dates back to the Middle Ages. The custom was for poor women to carry around the Advent images: two dolls dressed as the Virgin Mary and Jesus. Anyone to whom these dolls were shown was expected to give a halfpenny (ha’penny). It was believed that bad luck would strike any household not visited by these ‘doll bearers’ before Christmas Eve. Not a pleasant thought to carry with you into the New year . . . Thanks for this informative post, Millie! Really fascinating Millie, I never really thought about Advent really but it is fascinating to learn about how it is celebrated in different cultures and the many traditions. The US is such a melting pot there are many variations here. No matter where or how it’s a wonderful time of year!! Great blog , valuable information and excellent ideas. Many thanks, Millie! I love this post! My son made an advent calendar for my parents last year and it is so nice! We will put it up again this year! Lovely pictures as well Millie! Thank you, Lynn. It’s great that your son made a calendar you can reuse. He must be very artistic. I imagine it will be making an appearance for years to come. 🙂 A friend of mine made a lovely tapestry calendar for her teenage daughter. She stitched 24 pockets on the front and put gifts of money and useful items in each one. It was a welcome gift for a hard-up student, and so well made. They love it and this weekend I will pop over hang their lights, fill the calendar with candy and help dad make his gingerbread men! so it will be fun! Hi Clare! Interesting post, Millie! I’d never heard of the Christingle tradition before. What do people do with them after the service? Good question! As far as I know they just take them home to use as a decoration until after Christmas. At least, that’s what schoolchildren do after Christmas services. 🙂 Hope your last day of NaNo goes well! I was thinking that the oranges would start to go bad, since they’ve been cut into. And also that it would be hard for the kids to resist eating the candies! You’re probably right. The Christingles my children made at school when they were young just got thrown away. The candies/sweets had gone soft by the time they’d been on display in the classroom for over a week, so they wouldn’t have wanted to eat those. Ditto with the oranges. They look nice for a while, I suppose. It’s a strange tradition. As I said, it wasn’t a part of my childhood, but thins are always changing. Come to think of it, there’s a lot about Christmas that’s different now. Still, I do love the family aspects of it all. Very interesting, Millie. I hope you’ll write more about those other traditions too:0)). What a great post to start the Christmas season! 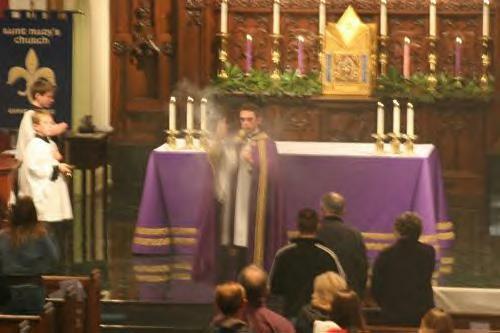 As you mentioned, our church altar is draped in purple, as are the priests’ garments. The church also has an Advent Wreath with three purple candles and one pink on a stand adjacent to the altar. 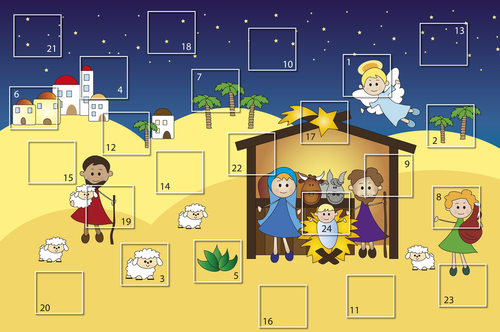 In our home, the advent calendar is made of little wooden doors framing a metal background scene. Each day, as another door is opened, reveals a magnetic “character” from the Nativity… lambs, stars, wise men, shepherd, angels, Mary, Joseph, and Jesus. The kids have fun manipulating the characters and rearranging the Nativity scene throughout the month. I have never heard of Christingles, but love the idea behind them. We are going to have to try making them here! I’ve always loved Christmas, especially when our six children were all little. What fun we had playing Father Christmas! There are some lovely old traditions, although the Christingle one is quite new, as traditions go. They can be decorated in other ways, too. I’ve seen some with ribbons going round from north to south on the orange as well as around the equator. This is often instead of using cocktail sticks (which are very sharp, if young children are about). Then cloves are stuck in all over the orange, instead of the sweets/candies on the sticks. I couldn’t find a free image to share, so I left that out. If I find one, I’ll add it to my post then. Your advent calendar sounds lovely, and having magnetic characters is a great idea so that kiddies can move them around. Children do love the Nativity scene, especially having done plays about it at school. I hope you enjoyed your Thanksgiving and are now well recovered from non-stop cooking! The month ahead is likely to be busy, too, with all the build up to Christmas.It’s already getting manic aroud the shops in Lincoln and Newark – the part I really don’t like. I hate being half trampled to death. Hope your Christingles turn out well. I’ve found smaller candles are better, too – like the ones used on birthday cakes or just a bit bigger. Thank you for that great comment, Jean! 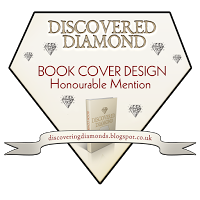 I’ll pop over to your blog and check out posts I’ve missed very soon. Great post Millie. Informative as always. I wonder how many people who celebrate Christmas know anything more about the traditions and beliefs around it? Yes, The family lit the candle for Hope last Sunday. No children were harmed in the process. I’m so glad to hear that – i.e. ‘no children were harmed …’ Ha ha. I’m sure it was a lovely service. Thanks, Millie! 🔦🔦 Sorry, couldn’t find a candle emoji! Maybe I can find something that looks like a candle? I’ll keep trying to shed some light on this! Easy for you to say.You don’t have to live with me! 🕯🕯🕯🕯🕯Millie! I found a candle! Yay! Nicely presented tradition! It is good to know why you do what you do. You’re absolutely right. In Britain we have traditions coming out of our ears and it’s good to delve into their origins, which are often very interesting. Thank you so much for reading. Yes, the first day of Advent is the beginning of the Christmas season, so for the next few weeks it be quite chaotic around the shops. But it’s also very colourful, with lights and Christmas trees everywhere. It’s a wonderful time for children, too. I’m glad my post helped you to know a little more about what Advent means, anyway. Thank you for the lovely comment, Khloe. You’re most welcome Millie. The lights, decorations and Christmas trees are what make Christmas very fascinating and as you said a wonderful time for children😍. Lovely post on advent, loved all the symbolism too. Thank you so much, Chioma. It’s funny just how many traditions are associated with Advent. It really is all part ot the wonderful build up to Christmas Day. Christingle services in churches are quite common nowadays, although they were unheard of when I was young. I agree that the symolism is really interesting. Oh,dear Millie,what an enlightening and well written post,my friend!I have read it twice up to now and I have learnt so many things about Advent and the customary symbolism and decorations.As an ardent traditionalist I always like to delve into the details and find out how and why they started.As you know,we,in Greece,are members of the Orthodox Church and we have different customs and traditions with some of them going back into ancient times and before Christ’s birth.But if we go deep down we can see that the core is absolutely the same.All of them and of any religion teach and celebrate the same things,the essence is one and only one.That’s why I am not dogmatic at all and I like studying and learning the “different”.We have some friends in the UK who are Methodists and I know all about the Advent Wreaths and the candles.They sent us recently a photo with the Advent Wreath and some robins on it.I so much liked the symbolism of the wreath.Yes,our God like a circle,no beginning no end.I like your holistic approach to everything and that you mentioned everything with respect to anything different.If I go on praising you and your article,I will never end.It was so interesting and well-organised.Happy weekend,my friend. Thank you so much, Doda. Like you, I love to delve into customs and traditions from all parts of the world, including those from different religions. I would never try to influence people one way or the other regarding beliefs. I would present Hindu or Buddhist customs in much the same way as I do Christian ones of the various denominations. I find them all fascinating. It’s lovely that you have Methodist friends in the UK. Advent wreaths are used in most denominations here. The Christingle is relatively new to Britain, but is popular at particular services, most aimed at children. Christmas is a wonderful time, no matter which branch of Christianity you follow. I would love to find out about some of the traditions in the Orthodox Church, although, as you say, the essence of all branches of Christianity are the same. Thank you again for reading my post. I enjoyed writing it as my first ‘Christmassy’ post this year. Enjoy the rest of your weekend, too. It has been ages since I contacted you,I was away from WP for a couple of days and I’m trying hard to catch up!Thank you so much for your rich response!I absolutely agree with your viewpoints,religion belief is a very delicate and personal matter. Catching up is always hard to do. I’ve found the same, after I’ve been away from home for a while. No one will expect to to read every post you miss, Doda. Some people post every day – some more than once – and it does become too much to manage.